Chimichurri in Argentina is much like Ketchup here in the U.S ... it goes with everything but especially steak! We take tender cuts of sirloin steak, marinate them in a rosemary, garlic wet rub then serve kebab style with our all-star, homemade Chimichurri sauce. Paired with cheesy, creamy twice baked potatoes, how do you say Yummy in Argentina? Sirloin steak, potatoes, cheese, shallots, scallions, mint, parsley, garlic, ginger, olive oil, lemon juice, vinegar and spices. Preheat Grill. Grill kebabs for about 4 minutes per side for medium and 5 minutes per side for medium well. Preheat oven 425F. Bake potatoes for about 20 minutes until warm. Serve with Chimichurri sauce. Very nice selection of vegetables and steak. Good size chunks of steak cooked just right. Not hard or dry. Tasty minty sauce. I've had this before and it has been consistently delicious each time. 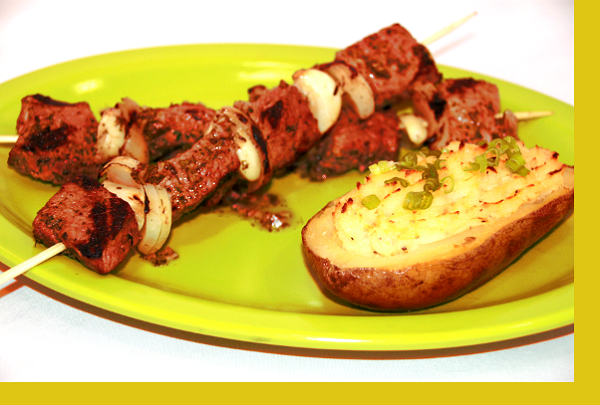 My children loved this kebab and the potatoes were delicious. I also appreciate that this was easier to cook than some other dishes. We will order again. I like how the meat was sliced making it so easy to marinate and prepare. We thoroughly enjoyed this meal. This was a treat, I am not a rosemary fan but wanted to try this dish anyway. The meat was well flavored but I would have enjoyed more onions on the kabob, one small piece was not enough. The twice baked potatoes were delicious. 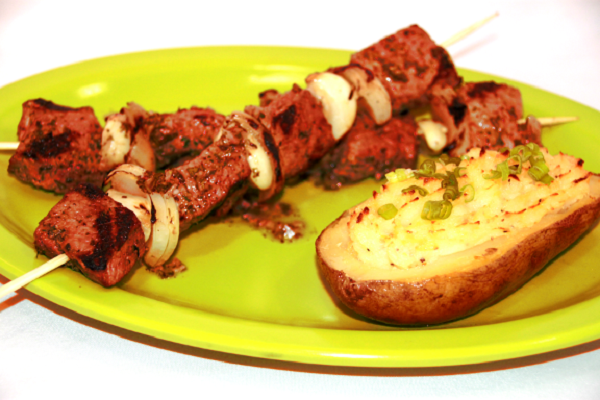 These sirloin kebabs were so good: well marinated, well seasoned and very tender. I have never had kebabs with chimichurri sauce and it was delicious. Plus they came with perfectly twice baked yummy potatoes. Thank you Maria.